On February 2006, Canadian generic firm Biolyse requested Health Minister Tony Abbott and Industry Minister Maxime Bernier to add Osteltamivir to the Canadian's list of pharmaceutical products eligible for compulsory licensing for export. See the Letter to Health Minister Tony Abbott and Minister of Industry Maxime Bernier. On July 2006, the canadian Goverment announced that Oseltamivir was added to the Schedule 1 List. For the official publication see Canadian Gazette. For information on disputes over Oseltamivir-Tamiflu and this specific case, see the CPTech Page on Oseltamivir. and also CPTech Page on Canada. For a large number of US compulsory licenses examples, see the September 29, 2001 CPTech document Examples of Compulsory Licensing of Intellectual Property in the United States. On January 29, 2004, the nonprofit corporation Essential Inventions petitioned the US Department of Health and Human Services for compulsory licenses to manufacture and sell inexpensive generic versions of latanoprost (Xalatan) and ritonavir (Norvir). Both drugs were developed with federal funding, and the government has rights through the Bayh-Dole Act to "march in" on the patent rights and license them to another producer. On August 4, 2004, the NIH turned down the request for ritonavir. It has not yet responded to the latanoprost request. Essential Inventions page on its request for a compulsory license for Latanoprost (Xalatan). Essential Inventions page on its request for a compulsory license for Ritonavir (Norvir). The anthrax scare in the fall of 2001 led DHHS Secretary Thompson to seek a large enough stockpile of ciprofloxacin (Cipro) to treat 10 million people. This quantity was far greater than the supply, and Bayer lacked the capacity to produce such a large quantity in a timely manner. On October 16, Sen. Schumer asked Thompson to issue a complusory licenses to generic manufacturers. CPTech Page on the 2001 dispute over a compulsory license for Cipro in response to the anthrax scare. October 16, 2004. Press release from Sen. Schumer's office. New Cipro Source Could Dramatically Increase Supply - Federal Law Allows US to Purchase Generic Version of Cipro Directly From Manufacturers; Would Significantly Reduce Prices, Increase Supply. On May 22, 2001, a licensing agreement was reached between Roche and Chiron. Roche had been attempting to get the German government to get it to issue a compulsory license for patents on "Blood screening HIV probe" held by Chiron. Under the terms of this licensing agreement, Roche will end its attempts to obtain a compulsory license. Blood Screening HIV Probe Licensing Agreement. In October 2000, Chiron and Roche resolved all pending litigation between them in the United States, Italy, Japan, the Netherlands, Belgium, Germany and Australia regarding HCV and HIV nucleic acid technology. Among the settlement provisions, Chiron granted Roche licenses to manufacture and sell HCV and HIV nucleic acid clinical diagnostic tests. Chiron also agreed to license Roche for a limited time period to sell HCV and HIV nucleic acid tests for blood screening. In December 2000, Roche initiated two nullity actions against Chiron's German national patents (the '104, '524 and '527 patents), and the European '931 patent in the German Federal Patent Court ("Bundespatentgericht"). In January 2001, the Bundespatentgericht divided the German patent suit into three individual actions. Compulsory Licenses Issued by the Italian Competition Authority. October 9, 1995. "Compulsory License for Hepatitis B Vaccine Entitlement Received". Industry News (Licensing). Bio-Technology General Corp. (BTG), Iselin, New Jersey, announced that the Israeli Registrar of Patents has ruled that Bio-Technology General (Israel), is entitled to a compulsory license to Biogen's Israeli patent No. 59007 which relates to genetically engineered hepatitis B vaccine. The Registrar's decision follows proceedings which began in January 1992 when BTG filed its application for a compulsory license. For information on compulsory licensing disputes over the BRAC breast cancer tests, see the CPTech Page on Myriad. Malaysia - On September 29, 2004, the Malaysian Minister of Domestic Trade and Consumer Affairs issued a two-year goverment use compulsory license to import from Indian didanosine (ddI), zidovudine (AZT) and lamivudine+zidovidine (Combivir). Translated copy of notice of license issued by the Malaysian government for the import of antiretrovirals. CPTech Comments on the Malaysia Compulsory License. Indonesia On October 5, 2004, Indonesia issued a compulsory license to manufacture generic versions of lamivudine and nevirapine, until the end of the patent term in 2011 and 2012 respectively. The license is for government use, and inludes a royalty rate of 0.5% of the net selling value. Text of the compulsory license. Korea - On January 30, 2002, the People's Health Coalition for Equitable Society, the Association of Physicians for Humanism, and the Korean Pharmacists for Democratic Society jointly filed for a compulsory license for Glivec. This is a drug that has been highly successful in treating chronic myelogenous leukemia (CML), and a stomach cancer called gastrointestinal stromal tumor (GIST). Norvartis sets the Korean price according to the price in seven high-income countries, so the drug is priced out of reach for most Koreans. Half a year earlier, US Secretary of Commerce Donald Evans, had written the Korean Ministers of Health and Trade, threatening a "serious trade dispute" over drug pricing. The request for a compulsory license was quickly denied. July 2, 2001. US Secretary of Commerce Donald Evans. Letter to Kim Won-Gil, Korean Minister of Health and Welfare and to Hwang Doo-yun, Minister of Trade on drug pricing. January 30, 2002. HeeSeob Nam and SungHo Park. Petition for a compulsory license for registered patent No. 261366 in accordance with Article 107(1)(iii) of the Korean Patent Law. February 3, 2003. Korean Intellectual Property Office. Decision on the Request for Adjudication for the Grant of a Non-Exclusive License. For more information on this dispute, see the CPTech Page on Gleevec/Glivec. On September 19, 2002, the Treatment Action Campaign launched a complaint with South Africa's Competition Commission against GlaxoSmithKline and Boehringer Ingelheim. The complaint charged these corporations with excessive pricing in respect of ritonavir, lamivudine, ritonavir+lamivudine and nevirapine. GSK and BI were found to have contravened the Competition Act of 1998, and to have abused their dominant positions in their antiretroviral markets. The terms of the final settlement require the firms to 1) extend the voluntary licence granted to Aspen Pharmacare in October 2001 in respect of the public sector to include the private sector; 2) grant up to three more voluntary licences on terms no less favourable than those granted to Aspen Pharmacare; 3) permit the licensees to export the ARVs ot sub-Saharan African countries; 4) permit the importation of the drugs for distribution in South Africa if the licensee does not have manufacturing capability in South Africa; 5) permit licensees to combine the relevant ARV with other antiretroviral medicines; and 6) charge royalties of no more than 5% of the net sales of the relevant ARVs. Complaint Submitted to Competition Commission. October 16, 2004. Competition Commission Finds GSK and BI in Contravention of the Competition Act. Statement of Information by Consumer Project on Technology Concerning an Alleged Prohibited Practice in Terms of Section 49B(2)(a) of the Competition Act 89 of 1998. CPTech Page on the TAC Competition Complaint. On March 7, 2001, Indian pharmaceutical manufacturer CIPLA formally requested the South African Department of Trade and Industry to issue compulsory licenses to patents on the following HIV drugs: nevirapine, lamivudine, zidovudine, stavudine, didanosine, efavirenz, indinavir and abacavir. CPTech Statement on CIPLA's request. Wall Street Joural Story on the Request. May 4, 2007. Ministry of Health. Brasil decreta licenciamento compuls�rio do Efavirenz. April 24, 2007. Declaration by the Minister of Health that Efavirenz is in the Public Interest. This is the first step in the issuance of a compulsory license for the drug. Declara de interesse p�blico os direitos de patente sobre o Efavirenz, para fins de concess�o de licen�a compuls�ria para uso p�blico n�o comercial. For more information on this compulsory license dispute, see the CPTech Page on Brazil. On September 5, 2003, the Brazilian government issued a decree which would allow it toproduce or import generic anti-AIDS drugs without the consent of companies holding the patent on those medications. The health minister made it clear that the decree was meant to apply to antiretrovirals - specifically lopinavir, efavirenz and nelfinavir. The ministry said in a statement it had negotiated with the name-brand companies in August seeking a reduction of more than 40%, but was offered a maximum discount of 6.7%. Brazil and Merck reached an agreement in November. November 18, 2003. BBC. New Anti-AIDS Drug Deal for Brazil. August 22, 2001. Statement of Jose Serra, Minister of Health. August 23, 2001. Roche Brazil press release. Roche surprised by authorities' declaration. August 31, 2001. Roche press release. Roche and the Brazilian Ministry of Health Reach Agreement for Supply of HIV Drug Viracept. On January 8, 2001, the US formally brought its compulsory licensing dispute with Brazil to the WTO Dispute Settlement Body. At issue was Article 68 of Brazil's patent law, which allows compulsory licenses to be issued in situations where the patent holder does not locally manufacture the patented product (known as a "local working" provision). The US received a large amount of negative publicity, and on June 25, the US withdrew its WTO complaint. However, under the agreement between the two countries, this and other disputes will be negotiated through a bilateral "Consultative Mechanism," and Brazil will notify the US government in advance in the event that it finds it neccesary to issue a compulsory license under Article 68. January 9, 2001. 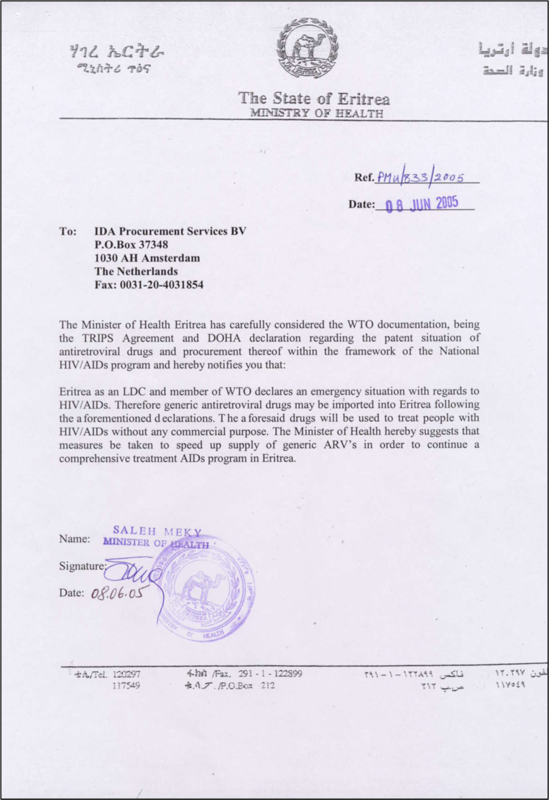 Document submitted to the WTO by the United States. Request for the Establishment of a Panel by the United States. February 1, 2001. Document submitted to the WTO by Brazil. Measures Affecting Patent Protection. February 6, 2001. Consumer Project on Technology. Statement on the Trade Dispute Between the United States and Brazil. Joint Communication from Brazil and the United States. Press Comminique by the Government of Brazil. In March, 2001, Merck agreed to cut the Brazilian prices of Indinavir and Efavirenz by 65% and 59%. In return, Brazil cancelled its plan to authorize generic production of the drugs in June. March 29, 2001. Reuters. Brazil Wins Fight Over Prices of Merck AIDS Drugs. March 27, 2001. Reuters. Brazil AIDS Drug Dispute Courtbound. For more information on these and other issues relating to IP and Healthcare in Brazil, see the CPTech Page on Brazil. (1) The use of the above patent rights are effective from today to the 31st December 2011. (2) The use of the above patent rights will be limited to the provision of Efavirenz to not more than 200,000 patients per year, for those covered under the National Health Security System Act B.E.2545, Social Security Act B.E. 2533, and the Civil Servants and government employees medical benefits scheme. (3) A royalty fee of 0.5 percent of the Government Pharmaceutical Organization total sale value of the imported or locally produced Efavirenz will be paid to the patent holder. Merck has marketing licence rights in Thailand and charges 1,500 baht/month (US $41). Thailand plans to import a generic version of the drug from India, at an estimated cost of 800 baht/month per person. The Government Pharmaceutical Organisation (GPO)'s managing director Mongkol Jivasantikarn announced that they will start producing locally in June 2007 and that they estimate a price of 700 baht/month. December 12, 2006 CPTech letter to Ambassador Susan C. Schwab. requesting the U.S. Trade Representative not to interfere with the Thai government's decision to issue a government-use license. December 21, 2006. Letter from 40 NGO's and 100 individuals to Condoleezza Rice, Secretary of State, and Ambassador Susan Schwab, United States Trade Representative and .html format regarding pressures on Thailand for issuing a compulsory license for the AIDS drug efavirenz. January 10, 2006 Letter from 22 members of Congress to Ambassador Susan Schwab, United States Trade Representative opposing interference with Thailand's legal efforts to ensure affordable access to the AIDS drug efavirenz. January 17, 2006 Response Letter from Ambassador Susan Schwab, United States Trade Representative to the 22 member Congressional letter, opposing interference with Thailand's legal efforts to ensure affordable access to the AIDS drug efavirenz. On January 25, 2007 the Goverment of Thailand announced two additional compulsory licenses on patents for the AIDS drug Kaletra (LPV+RTV) and the heart disease drug Plavix (clopidogrel bisulfate). (1) The use of the above Patent rights is effective from today until the patent expired or no essential need. (2) The use of the provision of generic drugs of Clopidogrel is unlimited for patients covered under the National Health Security Act B.E.2545, Social Security Act B.E.2533 and Civil Servants and Government Employees Medical Benefit Scheme but is under doctors� judgment. (3) A royalty fee of 0.5 percent of the Government Pharmaceutical Organization�s total sale value. (1) The use of the above patent rights are effective from today to the 31st January 2012. (2) The use of the above patent rights will be limited to the provision of Efavirenz to not more than 50,000 patients per year, for those covered under the National Health Security System Act B.E. 2545, Social Security Act B.E. 2533, and the Civil Servants and government employees medical benefits scheme. (3) A royalty fee of 0.5 percent of the Government Pharmaceutical Organization�s total sale value of the imported or locally produced Lopinavir+Ritonavir will be paid to the patent holder. For more information see the Essential Inventions page on Cameroon. 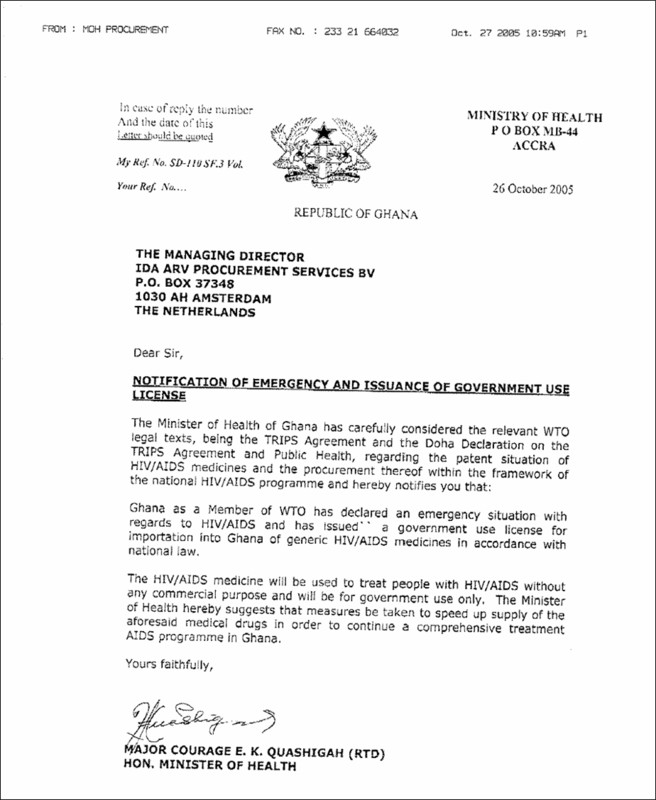 Ghana - On October 26 2005, the Minister of Health issued a government use compulsory license for importation into Ghana of generic HIV-AIDS medicines. Eritrea - On June 5 2005, the Minister of Health issued a compulsory license for for importation into Eritrea of generic HIV-AIDS medicines. Compulsory License Copy of Original. Zambia - On September 21, 2004 the Zambian Minister of Domestic Trade and Consumer Affairs issued a compulsory license for lamivudine, stavudine and nevirapine. The license was granted to Pharco Ltd., a local producer, which will produce a triple fixed-dose combination. A maximum royalty rate of 2.5% applies. Compulsory License No. CL 01/2004. Text version | Digital Copy of Original. Zimbabwe - In May 2002, Zimbabwe's Minister of Justice, Legal and Parliamentary Affairs declared a Period of Emergency in order to override antiretroviral drug patents for a period of 6 months. The declaration included a government use compulsory license to make, use or import generic HIV/AIDS medicines. In 2003, the period of emergency was extended by five years (until 31 December 2008). With assistance from India, Zimbabwe has begun local production of antiretrovirals though the generic company Varichem Pharmaceuticals (Private) Limited. General Notice 240 of 2002: Declaration of Period of Emergency. Patents Act Art. 35: Special Provisions as to State Use During Emergency. Mozambique - On April 5, 2004, Mozambique's Deputy Minister of Industry and Commerce issued a compulsory licenses for patent rights to lamivudine, stavudine and nevirapine. The license was granted to Pharco Mo�ambique Lda, a local producer that plans on manufacturing the antiretrovirals as a fixed-dose combination. Royalties are not to exceed 2% of sales. English translation of the compulsory license.